If you are looking for more traffic to your website(s)/Web Pages/Other URLs then this tool may help you with Backlinking, Submitting your site to search engines, etc. Where can I get all this for FREE, you ask? Well, that would be online at a place called BulkLink.org at http://www.bulklink.org. 1. Once you arrive there, you will see this big box that you would use to either type or copy/past all your website(s)/Web Pages/Other URLs. However, if it is a referral URL or an URL with an "? ", this tool will cut off everything behind the "?" so use an shorten URL too such as with Google at https://goo.gl. 2. Below the box on the left, you will be able to choose what search engines to submit your site(s) too. 3. Next to the second step, you can choose where to have your site(s) pinged. 4. Last step would be to choose the type of Backlinking your doing. Next to the big box will show how many "Bulks". You may need to adjust your choices for the above settings because you cannot have more than 20.000 "Bulks" (Do not ask me what this means as I have no idea). After you put in security code and click on submit, you can see it going to work right there in front of your eyes. Just keep that page open as a tab and let it run for the full amount of hours it needs to run for, typically 1 day. Lastly, just for fun, you can use LMGTFY at http://lmgtfy.com. Once here, you can type in whatever you want to in the Search bar. Then click on search. Below that button, you will see a URL you can share with whomever you want and it will automate the search for them. Here is the URL when I typed in "Affiliates Media" in the search bar. Go to http://lmgtfy.com/?q=Affiliates+Media+ and see what it does live. It is really cool. Shiftcode Price dropped a lot for one time set-up fee & by $10/month for hosting. Network / Site Owners:Beginning Monday September 28th 2PM EST all sites will experience some down time. Networks and any sites that are hosted on a dedicated server will be the first sites to return then the rest of them. We are moving to new license servers.What does this mean?Beginning from October 1st, we are able to pass savings from hosting bills to Shift Code site owners that are using average resources. Your new monthly hosting and licensing fee for your site(s) will be reduced to $29.95 for invoice(s) generated after October 1st. For sites that are using above average resources, we are unable to reduce the price just yet. We will continue our effort to reduce the cost and pass the savings back to you. Thank you for your continued support.We also have a new promotion plan that we will pay $50 for each new site sales generated from your referral link. Total fee for a new site is $89.95 including first month hosting. After that, it would be $29.95 unless the resource usage is above average. For existing site owners who plan to open new site(s), we will add the $50 discount back to your account for credit that can be used for future payments.$50 affiliate bonuses / discounts will be paid on Net 60 terms.The new rates pertain to Shift Code sites ONLY – Performa pricing will remain the same.If you have any questions, please open a ticket within your account after you register an account at at Alisa Holdings Inc. or login if your have an account there! BREAKING NEWS: NEW! ShiftCode GPT Site Special Announced! Right now, Shiftcode is offering 15% off monthly hosting if you pay for at least 6 months in advance in full. Any current admins who have a site or that have recently expired sites (within the 30 days) will qualify for the 15% for the next 6 months when paid in full. Set up fees for new sites will be waived if you are a current member in good standing. People who have never had a site or currently do not have an account with SC will also have the setup fee waived but will not qualify for the 15%. If you have any questions or wish to take advantage of this deal please send a support ticket via your SC account and we will get an invoice sent. You may register an account and/or login by Clicking Here. Once you have an account you can check out offered services within their cart by Clicking here. This offer ends September 30th. Shiftcode GPT Licensing and Hosting - Cost: $39.95 USD/monthly/Site + $210.00 USD One Time Setup Fee/Site (Wrong amount shown before check out but once in the chart you will see correct price)! ShiftCode GPT Offer Wall Installation - Cost: $50.00/One Time Setup Fee/Offer Wall (Offer Wall Installation To Your Shiftcode Hosted Site - Purchase 3 Offer Wall Installs & Get The 4th One Free). PerformaNetwork Affiliate Network Licensing and Hosting (Each and Every PerformaNetwork is integrated with ShiftCode GPT Sites so Admins can add offers really fast, easy, & you can post news for them to see in their ShiftCode Admin Panel as well - Cost: $349.95 USD Monthly/Site + $1999.95 USD One Time Setup Fee/Site (Shows correct price)! You may register a new domain, transfer an existing domain from your current provider to them, and/or pay the domain renewal which all have a yearly fee. When done with shopping you can "View Cart" and either pay via PayPal with your account or credit card. As a courtesy, Google has added a notice on Blogger, for those who have a blog hosted by them. The notice explains Google's use of certain Blogger and Google cookies, including use of Google Analytics and AdSense cookies. You are responsible for confirming this notice actually works for your blog, and that it displays. If you employ other cookies, for example by adding third party features, this notice may not work for you. Learn more about this notice and your responsibilities at https://www.blogger.com/go/cookiechoices. How to see the Notice if you are Outside European Union? Reference of below instructions are at http://www.mybloggertricks.com/2015/07/Custom-Cookies-notification-for-European-Union-countries.html (in case you need more information). .prx.gb.teleport.to - You can see an example by using our domain name (www.gpttweaks.com). 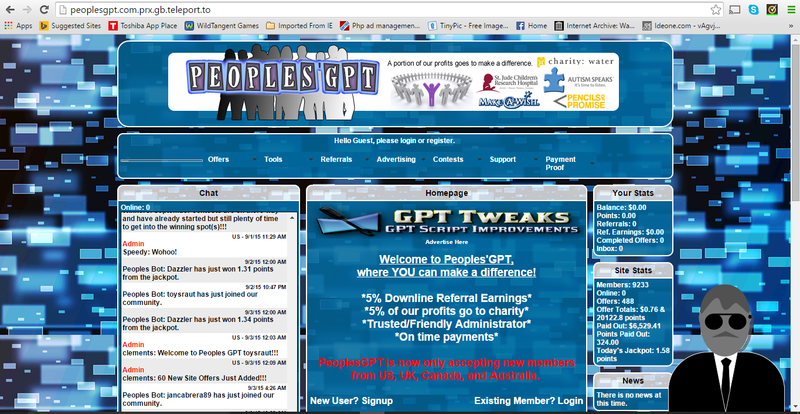 The URL would now look like http://www.gpttweaks.com.prx.gb.teleport.to (which you can click on to see it). However, this trick does not seem to work for all websites as you can see below! 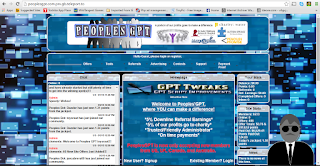 (peoplesgpt.com - http://peoplesgpt.com.prx.gb.teleport.to (which you can click on to see this). *Adopted from GPT Site Admins & Staff Connect Facebook Group by Christina Zoulek on July 28, 2014 at https://www.facebook.com/groups/gptadminsconnect/permalink/334394296722656/ (just in case you are curious). MUST work for a GPT company though to join this group!!!! Step 1: In your admin panel under "Paid To Signup" click on "Affiliate Networks"
Step 3: These are how you need to fill the info in. IPs: 192.95.126.2, 192.95.327.3 (only examples) - Can be found by clicking on "Tools" in Network at the way bottom of page. You should see two listed and it is different for each network. Step 5: You will login to the afftrack network & click "tools"
Step 7: Click on "Update Global Postback"
Exciting News! www.afftrack.com - it looks like the robust professional afftrack affiliate network platform (electronic advertising / publishing / marketing / tracking) has officially launched after an extremely thorough extended stage of testing and tweaking. This platform rocks! Check out the sharp new web site. It looks like they are currently accepting new clients with monthly rate plans starting as low as $99 and FREE to start and try! I feel wholly confident in recommending afftrack as this is the same network platform made famous by CPAWay where they've been using it most successfully for years now. 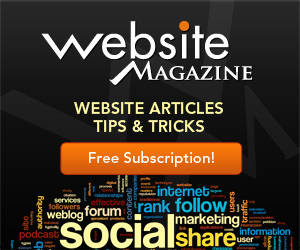 FREE Very Powerful Robust Feature Packed Ad Serving Script! For those with their own domain(s) and hosting account you have the option of easily installing Revive Adserver in a sub folder on one of your domains and enjoying a fully featured professional ad server acting as a global banner rotator for all of your web sites! You can define ad zones for various spots on your web sites (and/or your 'publisher's' sites) and then manage all your campaigns, banners, and zones from a single central interface! The script also includes power user options like banner 'weighting' where you can give certain more important banner ads more priority over the others in the rotation. The install is extremely simple. All you do is make a new folder off of your domain (example: 'ads'), upload all the files there, and then simply surf on over to that folder when you are through to breeze through the super simple and short (no brainer) automated install and configuration procedure. The only thing that may be considered a little tiny bit complicated (if you are a total noob installing scripts) would be creating a new MySQL database and username. ShiftCode GPT & Performa Network Paired Script Provider Service Companies Sold to Well Known and Liked Confident & Competent Purchaser! 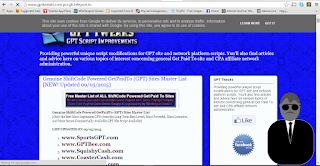 Yes, a matter of days ago from today both popular GPT script provider and integrated affiliate network script / platform provider ShiftCode and Performa were sold as a a pair for an undisclosed amount of money to a well known and well liked mover and shaker in the get paid to site and CPA affiliate network industries. 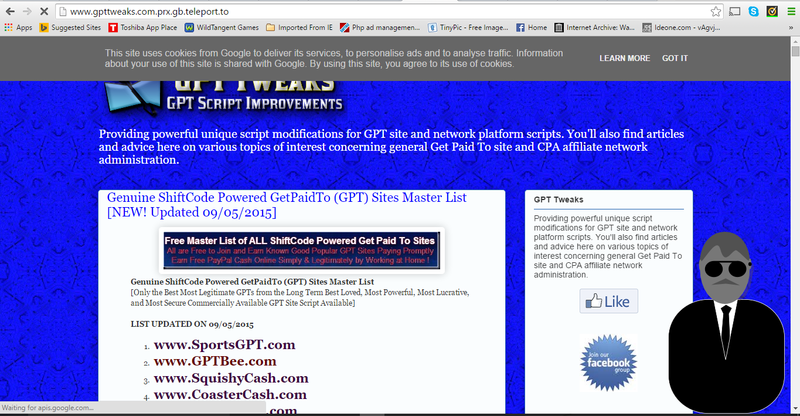 ShiftCode continues to be the one most popular, well known, and trusted GPT site script the online get paid to industry has ever known. Likewise, the fully ShiftCode GPT site script Performa network platform (also a script) get’s an infusion of new blood and ideas from the new owner. The entire industry thanks all those involved in the original development, evolution, continual improvement, defense (don’t ask), and continuance of both of these superior platforms. I hasn’t yet happened to me though I had been warned from several people who service the GPT and affiliate network industries of horror stories in which a person was truly trying (with an open and pure heart) to help someone with some type of coding situation on their site – in a trustworthy manner. The person needing the help just can’t seem to make the necessary correction to the configuration or some type of coding change and begs the person helping them to log in as them (the one and only admin account) The person needing the help then transmits their admin log in information over to the person helping and the problem is solved – cool beans right? Well not exactly according to these rumors / horror stories that have found their way to my sensitive ears. It seems that the first time that there is something wrong noticed, money missing, money added to an account, or something crashed then the first person that get’s blamed is that person the was being thanked oh so many times and so strongly earlier in the day, week, month, or year. The person who helped. I’m almost always happy to help anyone that’s nice with a GPT, network. script, or PC issue (yes, I fix neighbor and friend PC issues here locally too - lol) Almost always entirely for free just because I’m good at it and I enjoy helping. Please don’t ever ask me to log in as you in any admin account though – I simply won’t do it. Sure, yes, I’ll do my best at describing what YOU need to do but I won’t ever go in and do it for you (under an admin account) …the above blame-game that I’ve been warned of is why. I’d much rather stay beyond reproach and never having known how to access it than to risk ending up any sort of suspect in something that I wouldn’t ever do – That’s all. Please Just Don’t Ask Me to Log In As You.